Video will drive 82% of all Internet traffic in 2021, according to Cisco. 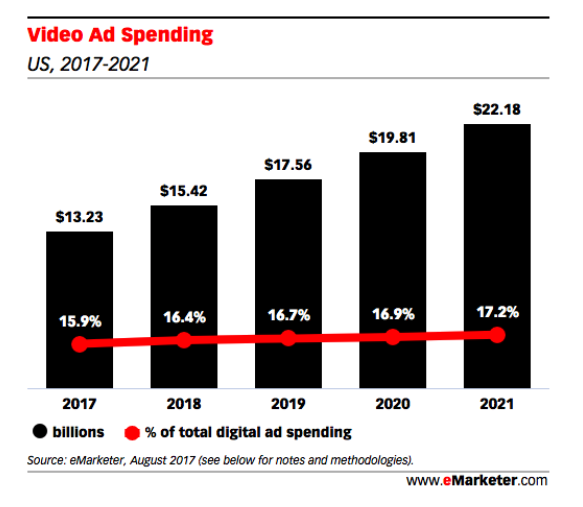 Over 17.2% of all ad budgets will go to video marketing, which means video ads likely eat up a huge share of the total video traffic. What does it mean for marketers? Video-first has become an overarching theme for consumer brands, and the B2B segment is quickly catching up. So it comes as no surprise that after successfully launching member video in August, LinkedIn, the number one social platform for B2B advertising, followed up with two ad offerings: video for Sponsored Content and Company Pages. For brands considering LinkedIn video ads, here's five reasons B2B marketers are taking note. Last year, several brands (including P&G and AT&T) pulled billions of ads dollars off social media and display advertising after multiple brand safety failures -- like one with kid-targeted ads showing next to violent and sexualized content. While brand safety is still a new (and subjective) metric for performance marketers, it was a major talking point at Advertising Week last year. For marketers who prioritize transparency and quality in their media buys, LinkedIn's quality environment for branded video campaigns is an obvious differentiator. LinkedIn’s suite of B2B targeting features for Sponsored video content campaigns allows marketers to segment audience by job title, seniority, company name, industry, skills, and more. 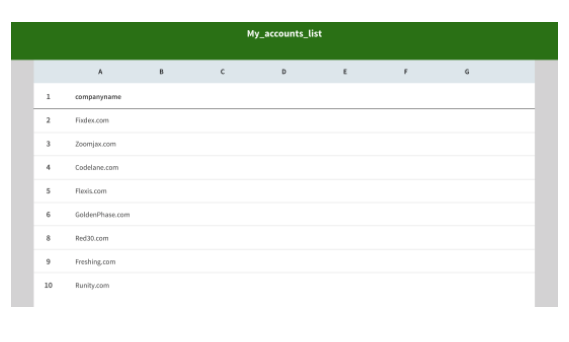 Marketers running ABM (account-based marketing) campaigns can upload a CSV file with their target companies to match LinkedIn’s company pages and reach decision-makers at scale. LinkedIn video ads show directly in the news feed, similar to organic standalone posts. According to Sharethrough, citing Nielsen’s research, native ads beat pre- or post-roll ads when it comes to brand consideration. 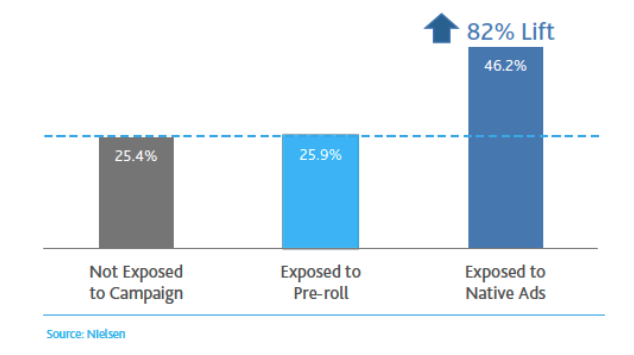 The chart below shows results for one campaign where native ads generated an 82% brand lift among users exposed to the ads as compared to 2.1% users exposed to pre-rolls. Note: the above data shows results for a consumer brand (CPG) campaign, so I’m just inferring that it could be applicable to B2B as well. Marketer use Sponsored Content across the full funnel to capture attention at the awareness stage, capture interest and drive qualified traffic to the website, and convert “warm” leads through LinkedIn’s integrated Lead Gen Forms. As Bettina Hein, Pixability’s CEO, said in Google’s recent post on online video trends, purpose-driven ads can achieve “the difficult task of authenticity” by aligning the brand with the causes they believe in. LinkedIn’s promoted video content on the Company or Showcase pages is a great way to implement that. Performance marketers can use Direct Sponsored Content to customize video ads for specific audiences or test ads -- without publishing on the Company Page. LinkedIn provides extensive metrics to measure your video campaign’s success through insights about the type of audiences watching and engaging with the campaign, as well as track clicks from video to website. By using the platform’s conversion tracking powered by the LinkedIn Insight Tag, marketers can see post-click and view-through conversions of their LinkedIn ad campaigns. For marketers who want to measure the value of lead generation campaigns from views to clicks and all the way to revenue and the acquired customers’ LTV, closed-loop reporting can help you untangle the B2B attribution and see the full picture of your campaign performance across LinkedIn, AdWords, Facebook Ads, Twitter Ads, Yahoo Gemini, Bing, and custom conversion data.